May | 2013 | That Mall is sick and that Store is dead! HAMPTON — Danny Shackelford and Kelly Jones deftly inserted their fingers and tools to fix videocassette recorders at the Langley Square repair shop that they work in off Mercury Boulevard. Outside, an electric saw screeched as it bit into a metal frame. A little more than two miles west, the Mercury Plaza parking lot was occupied by unlikely vehicles – wrecking machines, including an excavator and pavement shredder. They’ve turned one wing of the old mall into fine rubble. Langley Square and Mercury Plaza are separate places with different owners but with a common thread: Both 1960s-vintage malls are getting significant upgrades, giving them new lives along Hampton’s retail corridor. City officials said the refurbished malls would bolster the boulevard shopping district. The work at Langley is having an effect. Once completed, the two refurbished malls will have a “tremendous impact” on Hampton’s shopping areas. 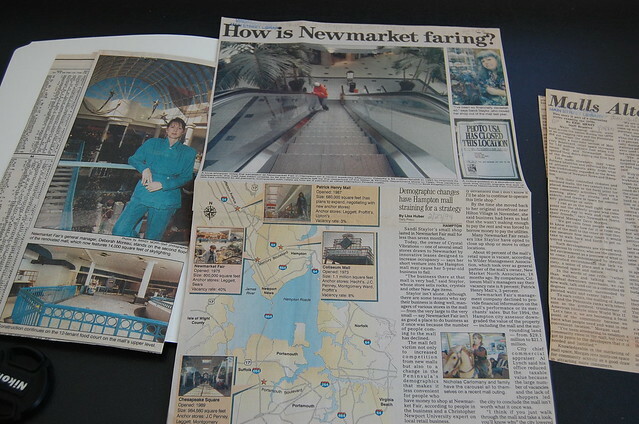 It’s necessary to renovate them to keep them viable, said Kathy Grook, Hampton’s retail- development manager. The city has a program ready to help mall owners renovate their properties, in part through low- interest loans. The program is awaiting financing. This summer, Mercury Plaza’s owners razed a building along its west side once occupied by a Farm Fresh grocery and other small shops. 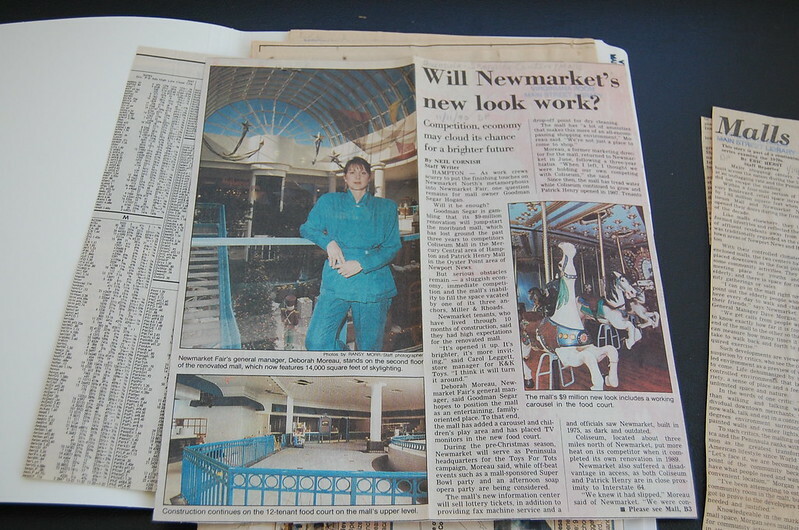 The supermarket had been vacant since a fire in 1997. Only a dry cleaners is left standing. Fashion Care Cleaners’ lease extends to December 31, 2000. Mercury Plaza is owned by Mall Properties Inc. of New York, the owner of Coliseum Mall. Mercury Plaza General Manager Raymond Tripp said the site was being cleared to make it more attractive to a new tenant. Waiting for Farm Fresh fire-insurance claims to be settled has delayed site improvements about two years. Rebuilding the grocery after the fire would have been expensive. “We thought it was more suitable to tear it down,” Tripp said. A new tenant is not been signed, but Mall Properties is negotiating with potential occupants, Tripp said. Eventually, Mall Properties wants to upgrade the exteriors of all Mercury Plaza stores, including Burlington Coat Factory, Circuit City and Home Quarters. 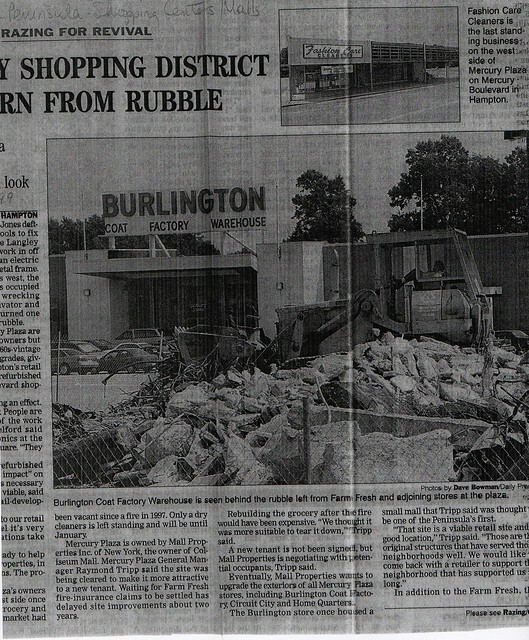 The Burlington store once housed a small mall that Tripp said was thought to be one of the Peninsula’s first. In addition to the Farm Fresh, the demolished building housed a music store and a beauty-supply store. “We’re eager to renovate it and bring it up to standards,” Tripp said. Langley Square is getting a complete face lift. A Food Lion supermarket and Family Dollar discount store are scheduled to open this fall. There, a wooden tunnel leads to Audio-Video Lab’s front door, where Shackelford and Jones worked surrounded by VCRs, televisions and stereo equipment. Holding a soldering iron one minute and a cotton swab the next, Shackelford worked to bring new life to the VCR on his workbench. The business owned by Bob McLain has seen some tough years, so the recent renovations are welcome. The construction even is attracting more customers, Shackelford said. The Audio-Video Lab isn’t the only business making a go of it before and during the renovations, which started earlier this year. Ling Nam Asian restaurant, Vito’s Pizza, Fertitta’s Grill, a hair salon, and a coin laundry also remain open. The new canopy over the sidewalk almost hides the blue-and-red neon “open” signs in many of their windows. Pallets of drywall sit where shoppers someday will stroll. The mall’s landlord, John Katsias of Virginia Beach, couldn’t be reached for comment. Jones, the Audio-Video Lab technician, said he was looking forward to sharing the mall with new tenants such as Food Lion. “It’ll be nice having somewhere else to go for lunch,” he said. Burlington was shut down and moved to Coliseum Mall in 2003, and effectively killed Coliseum Mall because nobody wants a Burlington in their mall. 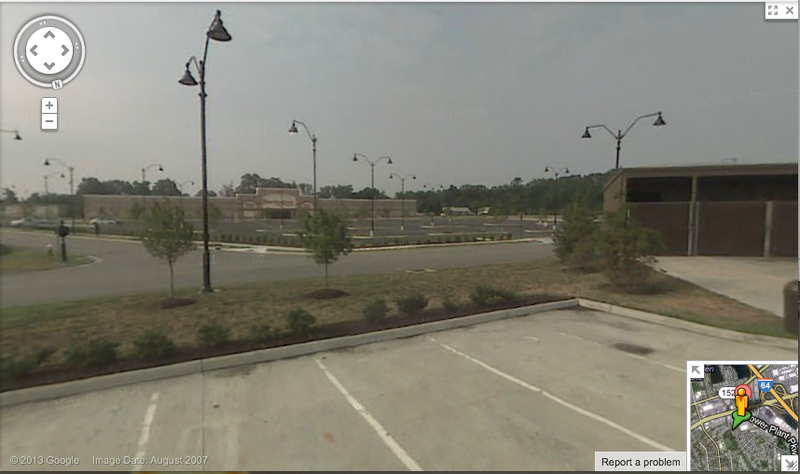 The last time Google maps drove by this site was in 2007, so the new Burlington Coat Factory wasn’t open yet, and the building was just finished. Former Target building sold to Goodwill Industries of Central Virginia – Daily Press. I just noticed this today when driving behind the old Target on the way to Wal Mart. There’s no sign up on the old Target yet, just Goodwill trucks in the back, and the cart deposit is painted “Goodwill Blue”. HAMPTON — Goodwill Industries of Central Virginia Inc. is opening a retail store and jobs center in the 118,000-square-foot building along Saville Row once occupied by a Target department store. The non-profit agency has purchased the property behind Hampton Chevrolet for $3.7 million, according to property records. The property is assessed at $5.5 million. Goodwill plans to run a retail store, outlet center, computer store, community employment center and support office in the facility once it opens in late winter or early spring, Goodwill Communications Manager Ellen Thornhill said. The retail store will open first, she said, and the ancillary services, such as the computer store and employment center, will debut later. Items not sold in the retail store are then discounted further and moved to the outlet area. At least 20 people will be employed in the retail area of the store once it opens. More employees will be hired as the space is filled with other services, Thornhill said. “Goodwill executives met with the leadership of Coliseum Central and discussed their plans for the building,” Elizabeth McCoury, Coliseum Central Business Improvement District executive director, wrote in an emailed response to an inquiry about the Goodwill store. The building at 1911 Saville Row sits on 9.5 acres and was used from 1996 to 2009 as a Target. In addition to the car dealership, its neighbors are Walmart and Langley Federal Credit Union. The building was closed when a larger Target was built in Peninsula Town Center — a .7—mile drive from the Saville Row location. Goodwill has headquarters in Richmond and Virginia Beach and operates retail locations in Hampton, Yorktown and Newport News. Despite being a non-profit organization, Goodwill pays the full compliment of real estate, personal property, state sales and business license taxes, said Ross Mugler, Hampton’s Commissioner of Revenue. Chris Rouzie handled negotiations on behalf of the buyer. He is the senior vice president and managing broker of Thalhimer, a member of the Cushman & Wakefield Alliance. “We’ve been in Hampton Roads for decades, but we’re really excited to deepen our presence in the region and this is a big step in that direction,” Thornhill said.